For Denise Starkey, chair and associate professor of theology and religious studies, education and job preparation are not one and the same. "The pressure for students to find jobs is so great that we sometimes forget the full purpose of higher education," she said. "College is supposed to be a holistic enterprise where students learn to think critically, ask questions and evaluate sources of knowledge. That's why general education is so important." 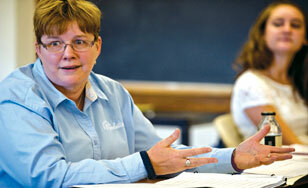 Starkey's zeal is why she has been named the College's Benedictine Professor - an annual award that recognizes and promotes teaching excellence in general education. As part of her responsibilities she'll host a faculty workshop to help her colleagues better incorporate the College's heritage outcome into their teaching - ensuring that all students, regardless of major, receive the holistic experience provided by general education.